The quintessential drive-in system featuring a screen that can accommodate up to 150 cars. Brilliant projection and studio quality stereo FM audio will immerse your audience in the drive-in experience. For 1,200 to 2,000 people. 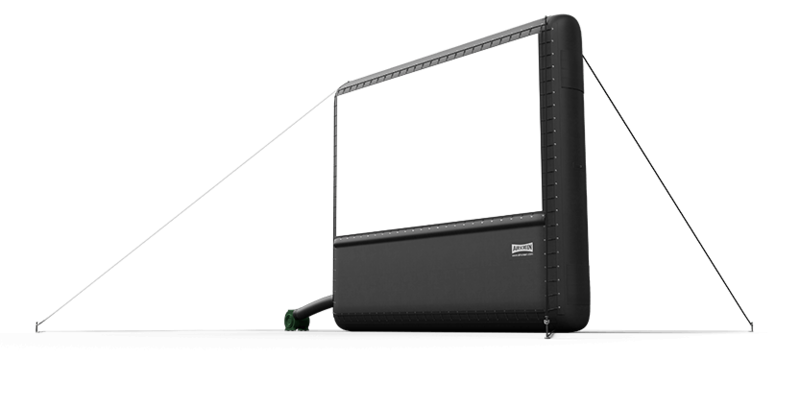 The 40′ x 22′ is a great size AIRSCREEN® inflatable outdoor movie screen. With 880 square feet of screen, your audience will be WOW’ed! Whether you plan on drive-in movies all the time or occasionally, our fully featured drive-in rack is complete with everything needed for drive-in production. Our stereo FM transmitter has all the bells and whistles: compressor/limiter, fault and circuit protection, and so much more. With this console you will also receive a commercial grade dipole FM transmission antenna. Full 12,000 Lumen 1920x1200 HD quality images for sharper, clearer images for outdoor movies. This professional projector can be used for screens up to 40' wide. Ships FREE in continental USA. Same great warranty you'll find in every Optoma brand outdoor movie projector! Broadcast Warehouse TX5 V2 rack-mounted FM transmitter, with audio limiter and antenna fault detection. The TX5 V2 is a broadcast quality FM transmitter, perfect for in-car sound at drive-in movies. It is packed with features to improve audio quality and reliability, including built in 4-band DSPX audio processing. Quite simply the best 5W FM Transmitter on the planet. Most importantly, we value our relationship with you and we will do everything possible to demonstrate your value to us as a customer today and tomorrow.